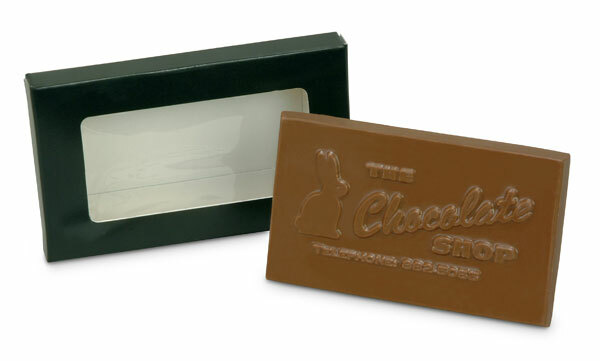 Custom chocolate bars about the size of a business card, that are custom molded with your company name, logo, holiday greeting or web address. Don't risk ordering chocolate from some advertising pen novelty company, where you don't even know who's making it. Get your custom chocolate from The Chocolate Shop. We've been making delicious custom chocolate for over 65 years! Looking for a larger or special shaped chocolate bar? We can make almost any shape or size. See our Chocolate Bars and Custom Molded Chocolate pages for more information, or Contact us for a quote for your custom chocolate bar.